1. To Stop Traffic. The flagger shall face traffic and extend the flag horizontally across the traffic lane in a stationary position so that the full area of the flag is visible hanging below the staff. For greater emphasis, the free arm may be raised with the palm toward approaching traffic. 2. When it is Safe for Traffic to Proceed. The flagger shall stand parallel to the traffic movement, and with flag arm lowered from view of the driver, motion traffic ahead with free arm. Flags shall not be used to signal traffic to proceed. 3. Where it is Desired to Alert or Slow Traffic. 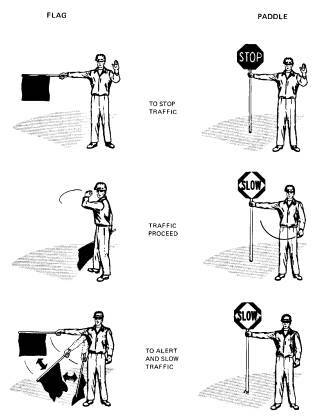 Where it is desired to alert or slow traffic by means of flagging, the flagger shall face traffic and slowly wave the flag in a sweeping motion of the extended arm from the shoulder level to straight down without raising the arm above a horizontal position.